Over the winter, I had purchased a variety pack of meat from a local CSA. One of the items was a Pork Roast. Since it was my first time buying anything from a CSA, I wanted to do something a little different with it, to give the meat a chance to shine through and not be to covered in a sauce. That seemed the best way for me to judge the quality of this meat and see if I wanted to purchase more. I finally found a recipe that seemed to be what I was looking for. It had nice flavor, but wasn't to heavy. It was delicious! The meat definitely shined through! 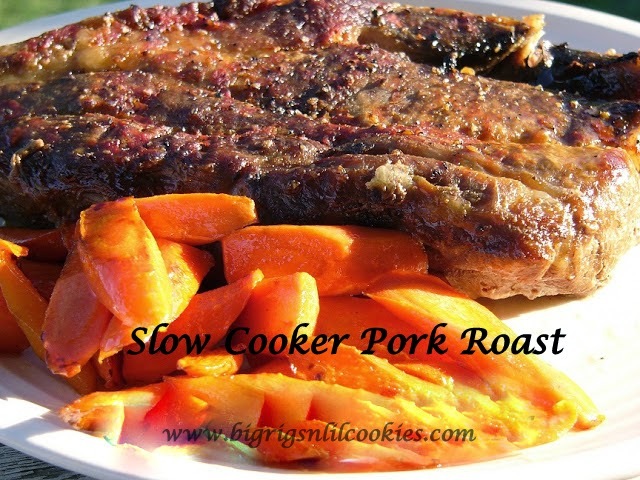 Served with Maple Glazed Carrots and some Garlic Smashed potatoes, the meal was complete. Season roast with salt and pepper. In large pan, brown roast all both sides. Arrange onion slices evenly over the bottom of the slow cooker. Place roast on top of the onions. In bowl, mix together remaining ingredients. Pour over roast. Cover and cook on low for 5-6 hours, or high for 3-4 hours. Hey great pork dish! The subject of this week's Food on Friday on Carole's Chatter is Pork. It would be great if you linked this in. This is the link . I am following you now. Please drop by to Carole's Chatter and check it out. If you like my blog it would be great if you followed me back. Have a good week. Thanks for linking this in and a huge thank you for following Carole's Chatter - you are number 300! Woo hoo. Have a great day.